'Dangerous' Islamist Preacher Set To Be Released Early From U.K. Prison Anjem Choudary, convicted of exhorting people to join the Islamic State, is set to walk free next month after serving half of his sentence. Radical preacher Anjem Choudary is set to be released early from a U.K. prison after being sentenced to five and a half years in prison for encouraging people to join ISIS. But Choudary remains "genuinely dangerous," Prisons Minister Rory Stewart tells the Evening Standard, adding that U.K. security officials and police will have to watch the 51-year-old cleric "like a hawk." Choudary's early release is pro forma under U.K. law. "Most prisoners must be automatically released at the halfway point of their sentence," a spokesman from Stewart's office told NPR, citing the the 2003 Criminal Justice Act. 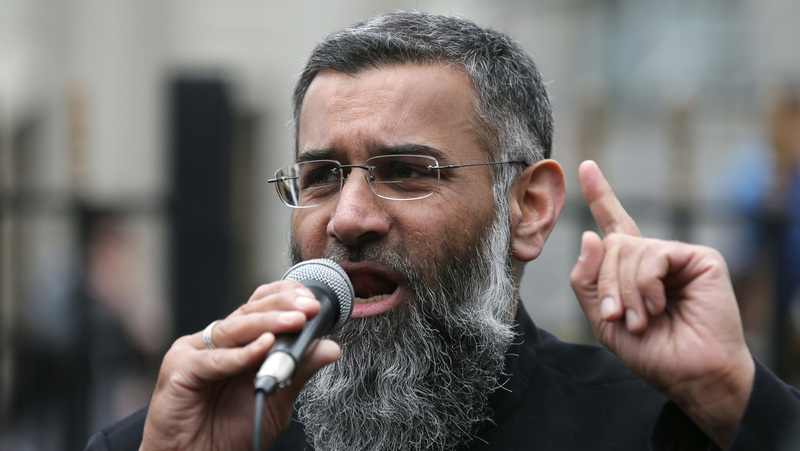 Choudary was credited with several months he spent in prison before his sentencing. His trial touched on some two decades' worth of evidence gathered by law enforcement, the BBC reports. He spread his message with tools as basic as a bullhorn on the London streets. Choudary was also digitally savvy, relying on Twitter and YouTube to reach a wider audience. "Police say he was hard to prosecute because he chose his public words carefully," NPR's Frank Langfitt reported at the time, noting Choudary's training as a lawyer made him an expert at staying just within the confines of the law. It was Choudary's own oath of allegiance to ISIS that gave prosecutors a legal opening and led to his conviction under the U.K.'s Terrorism Act. The judge in the case said Choudary showed no remorse and had justified the "most appalling acts" of ISIS. Choudary is also believed to have radicalized some 100 people who then turned to acts of terrorism, Langfitt reported. Among them was Michael Adebolajo, one of two men convicted of hacking to death a British soldier on a London street in 2013 while shouting that they were avenging the deaths of Muslims. Even when he was in prison, The Sunday Times reports, Choudary is believed to have kept up his radicalization efforts, this time aimed at fellow inmates. Officials attempted to put a stop to it by transferring him to a secure unit known as a "separation center" last summer. But with his separation from society set to come to an end, Stewart tells the Standard that officials will have to rely on other measures to contain the threat he says Choudary and other extremists pose: "That's GPS trackers, that's police, that's intelligence, watching every movement of their lives and restricting it incredibly closely because I'm in no doubt that these people are highly dangerous."